Taylor moving consultants can provide the facts to help your through the initial decisions. What to ship, and what leave behind? Taylor consultants can help you with the decision, room by room, piece by piece, keeping in mind factors such as the customs regulations at destination. Taylor can tell you the air and ocean rates and scheduling available at the time of your move, plus recommend which clean, dependable carriers to use. Taylor will partner with your to plan a move to be carried out with the utmost care, on schedule, at a favourable cost. Insurance companies insist on professional packing for overseas shipments. There is no better way to protect your furniture and possessions than the Taylor Pride-Pack System. Taylor's people are fully trained in this exclusive service, using a wide variety of specialized overseas cartons packing materials, and when needed, custom-built crates. Since Taylor do the packing, the company takes full responsibility for the safe arrival of every item, and will arrange full replacement cost insurance at regular rates. Customers are invariably impressed with the courteous, friendly crew and the care they take with each item they move. No casual labour here. Even the most junior helper has been thoroughly trained in the Taylor tradition. Your driver is the experienced foreman who ensure that your possessions are carefully inventoried as they are loaded, and properly marked for correct destination, whether for overseas shipment or into storage. Your belongings are carefully crated for secure travel and safe arrival. Building custom-sized wood crates to ensure a perfect fit is a routine part of the Taylor moving service. Taylor has every size and type of container for international moving, in wood and steel, for standard containerized cargo or in the special shapes and sizes for air-freight. Call 1-877-832-8010 or fill out the form below for a free moving quote. "The team arrived on time, were polite, helpful and had a sense of humour. 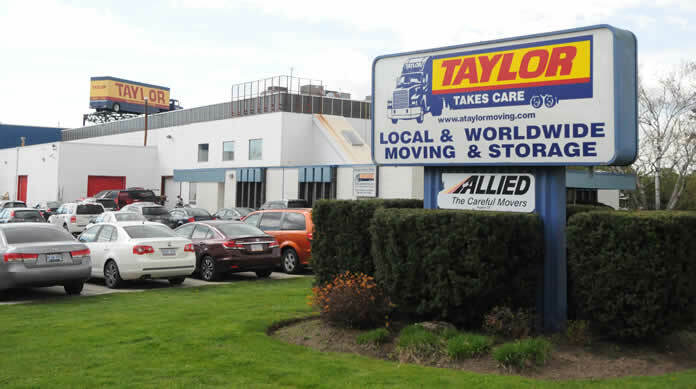 There were issues with a new electronic documen…"
Visit our subsidiary company, Taylor Moving and Storage. Recently Taylor Moving/Taylor International was presented the Platinum Award from Cartus Relocation. the highest award presented requiring a higher than 95% satisfaction rating from the relocating employee.